Petition drives were held in the George Washington Hotel. At least two angles were used on the petitions. The first concerned the lease executed between the City of Winchester and the Winchester Parking Authority. The petition asked for the City to resume control of the Conrad property and/or to hold a public hearing on the fate of the Conrad property. Reports indicate over 2,000 signatures were gathered and filled several full-page advertisements in the Winchester Star in March of 1969. PHW’s President Lucille Lozier spoke of the potential for tourists to appreciate Winchester’s buildings and their palpable connection to early American history and culture. (4) Others, like Anne Williams, suggested new community-minded uses for the Conrad House, like a daycare center. (5) More often, the building was suggested as being incorporated into new government offices, used as a residence for visiting dignitaries to the city, or operated as a museum. Alternative parking options were discussed, such as constructing a double or triple decker parking garage on another site. (6) In an idea which may seem scandalous to propose today, PHW members even pitched the idea to Council to level Rouss City Hall for the parking lot instead (remember that Rouss City Hall was deemed both too young for being constructed after 1860 and infeasible to rehabilitate at the time). The letter writing and petitions were not the only efforts undertaken by PHW. Efforts had been made for multiple years for PHW to receive authorization from the City or WPA to perform studies on the Conrad House to determine possible future uses for the building. (12) Even though the City refused these offers for studies, PHW still reached out to representatives from the National Trust for Historic Preservation, the Virginia Landmarks Commission, and other architecture experts for their input on the value of the Conrad House. Offers were made for PHW to raise the funds to fix the house’s leaking roof and to hire engineers and architects for the project. Attempts were made to list the building on the National Register of Historic Places to block the use of Federal funds in the construction of the parking lot. 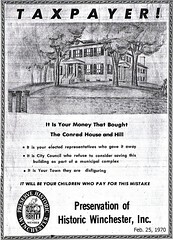 Injunctions were sought for the illegal tree-cutting on the Conrad Hill property, and efforts were made to appeal the Board of Architectural Review being cut out of the process for the Conrad House. As a final attempt, shortly before the demolition PHW ran a series of large advertisements in the Winchester Star alerting taxpayers as to how their money had been used to purchase the Conrad House, and how their money was funding this parking lot against public wishes. 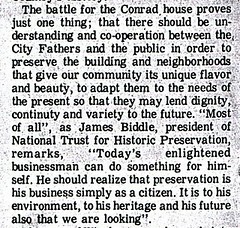 Although the City was not dissuaded from razing the Conrad House in March of 1970, the outpouring of support and frustration via the letter campaign bore some fruit in the end. 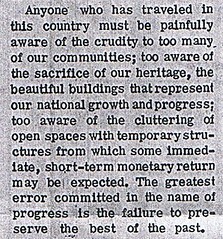 On April 22, 1970, the City Council and a committee of PHW members met and began taking some of the first steps toward meaningful preservation efforts. The major concession was the acknowledgement that a Board of Architectural Review with purview over only 16 properties was ineffective and invalid, and Tom Scully was granted permission to overhaul the ordinance and present his ideas to Council. The meeting also proposed a strategy to foster cooperation and understanding between the City and PHW by installing PHW members on various boards and Council members partaking in the historical programming of PHW and the Historical Society. Although it took close to a decade, preservation was gaining acceptance in Winchester. Next week, we will investigate the educational efforts as PHW moved into an era of preservation not focused on the retention of the Conrad House.